This is the default screen of settings administration screen. 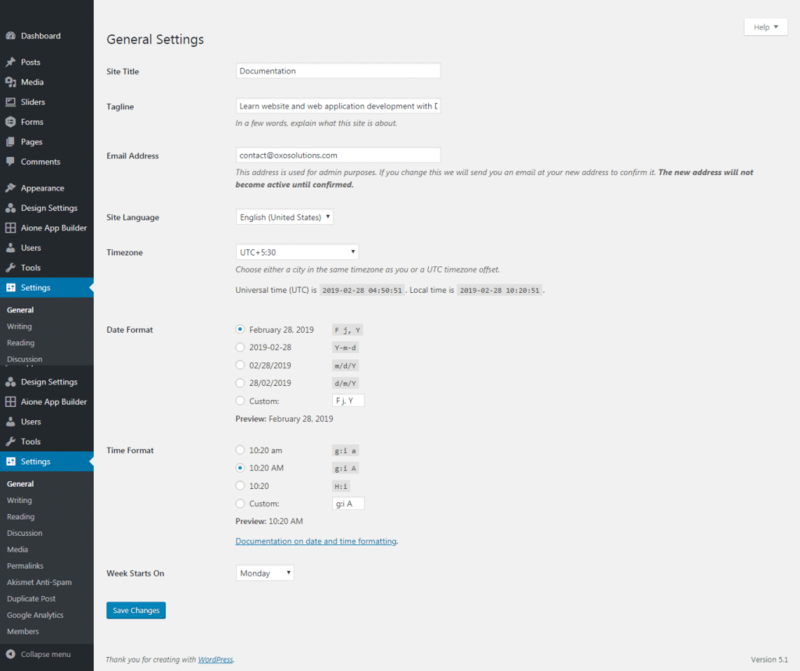 It controls some basics of the configuration settings of your site. You can set the site title, tagline, timezone and choose a particular format for the date and time. Click on save button to make the changes effective. Site Title: Here you have to enter the title of your site or blog. It displays at the top of your site's each page and in the reader's browser title bar. It is also used as the identifying name of the syndication feed. Tagline: Here you have to write a short text to tell your users, what your site is about. It is usually an eye-catching short phrase. Email Address: This address is used for admin purposes. If you change this we will send you an email at your new address to confirm it. The new address will not become active until confirmed. Timezone: From the pull-down box you need to select a city with the same timezone as yours. If you don't recognize the city in your timezone, then you need to select UTC timezone offset. Date Format: You can choose one of the different date formats available to display on the site. Time Format: It is the format in which theme developers intend to display the time on the site. Week starts on: You can choose a day from which your calendar will start on. The default day is Monday. Save Changes: This button ensures that your settings have been saved in the database. As soon as you click on this button, a confirmation box will appear on the top making sure that your changes have been saved. Default Post Category: This option allows you to set the category for those posts which you have not assigned any category. Another case where it can be useful is when you delete the category of any post, then default category is assigned to the post. 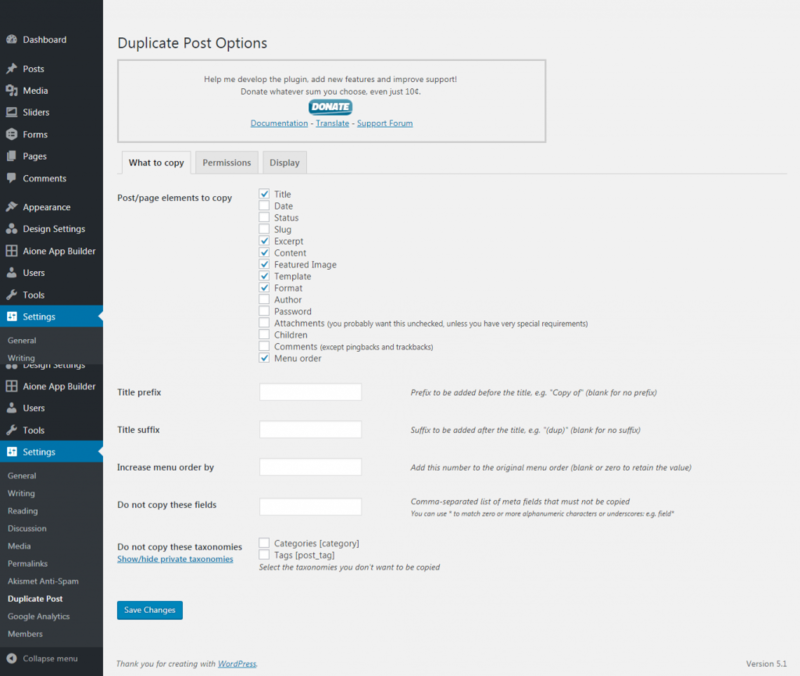 Default Post Format: The list in the drop-down allows you to choose one format in which you want to display your post. You can provide different styling to your post in different ways. Save Changes: Clicking on this option makes sure that your changes have been saved in the database. This is further confirmed by a confirmation text box that appears at the top of the page, once changes have been saved. The screen contains the settings to let you decide the display of your content. You can decide if you want to display "your latest post" or a "static page" as your "main page". 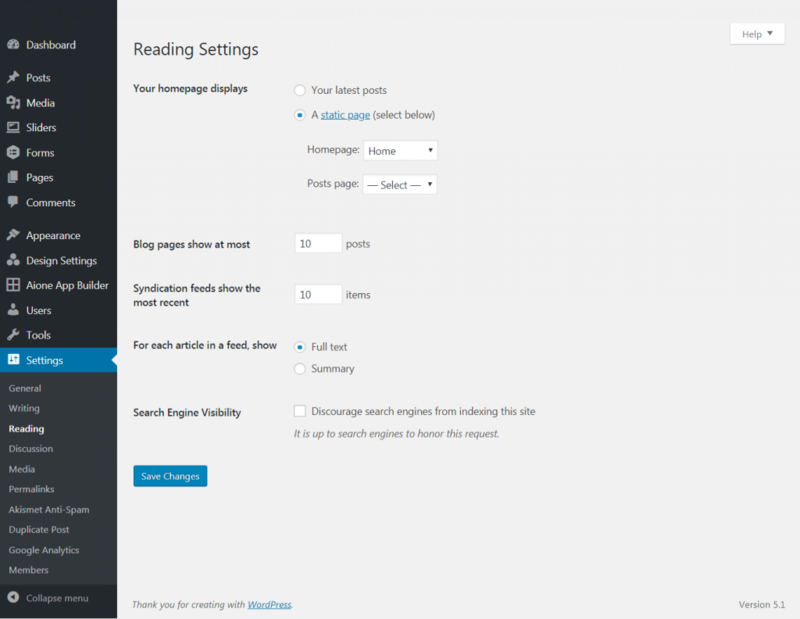 You can adjust the numberof blog pages to show at most and syndication feeds to show at the most recent. You can choose the styling for each article in the display i.e either it can be full text or summary. In addition you can choose to enable or disable the search engine visibility. Your Latest Posts: Select this radio button to display your latest post on the home page. A Static Page: Check this radio button to choose a static page to be displayed as the Home Page. At the same time, you need to select the page where you want to display your posts. Front Page: Select the page in the drop-down box that you want to display as the front page. In case you do not select any page, then your home page will be the same as your posts page. Another important thing to keep in mind is to never save your page as home.php it will create a problem when you try to view the blog section of your home page. 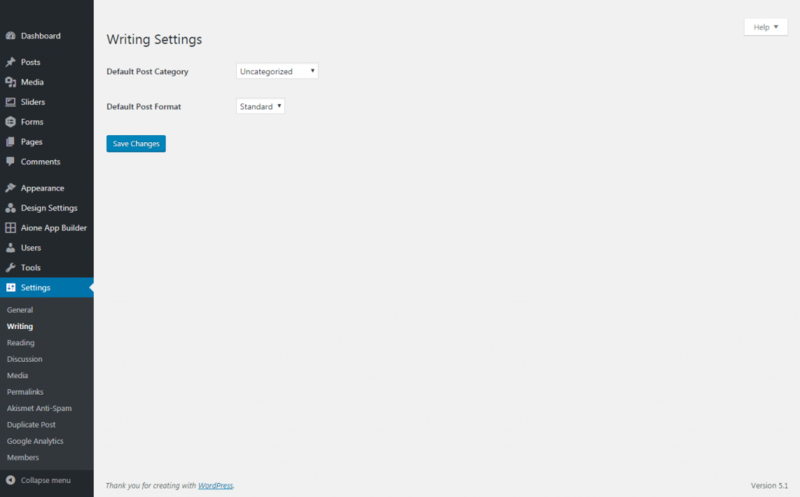 Posts Page: In the pull-down box select the page that you want to use to display your posts. If you do not select any page you will not be able to access the posts page via. categories, archives, or calendar links. Even if it is a password protected page then also visitors will not be able to view the page. Also, assigned templates will be ignored and the index.php page will control its display. It allows you to enter the number of posts that you want to display per page in your site. It enables you to choose the number of feeds that you want to allow the people to view when they download one of your site's feed. You just need to enter the number in the input box. It enables you to choose whether or not the feed will include full article or just a summary. Full Text: Click this radio button to include the full content for each page. Summary: Click this radio button to include the summary of the post. You can control whether or not your site will be crawled by the robots, ping services, and spiders. You can check the box to discourage the search engines from indexing your site. This screen allows the management of the comments, avatar and the links to your pages/posts. It also provides an option to set the circumstances in which your blog will send an email notification of certain events at your blog. This settings can be overridden for individual posts. Attempt to notify any blogs linked to from the article: Clicking the checkbox will enable you to receive pingback notification. This means your mention of someone's site or article will let them know in their comment section if that allows pingbacks. Allow link notifications from other blogs (pingbacks and trackbacks): This allows you to either to enable or disable pingbacks and trackbacks from the sites which have referenced your site or article. If this option is checked your pingbacks and trackbacks will appear in the comment section. Allow people to post comments on new articles: You can check this box if you wish to allow comments to your post. By making an article private you can control the comments, which would require a password before a comment is allowed. Comment author must fill out name and e-mail: You can check this option if you wish to receive authors name and email address. It also helps in reducing the number of spam comments. Users must be registered and logged in to comment: Check this box if you want to have comments only from the registered or logged in users. Automatically close comments on articles older than [X] days: Check the box and enter the number of days after which you don't want to have more comments. Enable threaded (nested) comments [X] levels deep: You can enable this option in case you wish to have the threaded comments and can then select a number from the drop-down box in order to define the level of depth for the nested comments. Break comments into pages with [X] top level comments per page and the [last/first] page displayed by default. Comments should be displayed with the [older/newer] comments at the top of each page: Check this box to have the pagination for your comments, this further allows you to select the number of comments per page, the order of pages i.e. either "first to last" or "last to first" and in each page whether the new comments or old comments need to be displayed first. This option helps in keeping track of the number of comments made on the post and the comments that are held for moderation. This is a useful way for the post authors and administrators to have control over the comments that have been made by getting notified for the available options. Anyone posts a comment: In this case author of the post will be notified for all the comments that are made on the post. But one thing is to keep in mind that in case you receive more comments on the post you will find your email completely full. A comment is held for moderation: In some cases a post may have multiple authors and each on is authorized to accept or decline the post. Then as a owner of the site you can review what comments are allowed or denied. Notifications are received on the email listed in Administration > Settings > General option. An administrator must always approve the comment: Check this option if you wish that a comment must be approved prior of its publication by the blog user or the person assigned with the proper role to approve comments. Comment author must have a previously approved comment: This is to make sure that the comments are only posted if the email id matches with the previously approved comments email id otherwise the comment will be held for moderation. Those email addresses which are placed in the blacklist are held for moderation even if they are showing white list status. In the recent past, spammers would have five or ten hyperlinks in the comments. This would make easy for the bloggers to identify the spam comments but nowadays hyperlinks have been reduced to one or two. But using this option you can specify the number of links that you want to show in the comment before holding it for the comment moderation. In the space provided, you can add the spam words which will help you in filtering the comments. When a comment contains any of these words in its content, name, URL, e-mail, or IP, it will be marked as spam. One word or IP per line. It will match inside words, so "press" will match "WordPress". This option implies to delete all the comments without warning, that contains matched words. This should be considered as last option, otherwise you may end up losing some genuine comments. Avatar Display: Check the box to display the avatar. Maximum Rating: This means the highest rated avatar will be allowed to be displayed. Save Changes: You can click the save changes button to ensure your changes have been saved in the database. Once you click this button a box will appear at the top of the window confirming your changes. This screen is to set the maximum image sizes, used when writing posts. 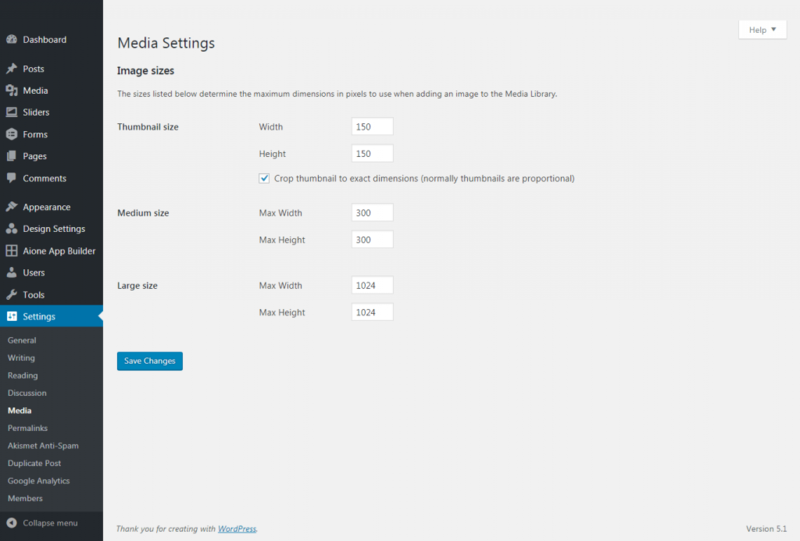 The sizes listed below determine the maximum dimensions in pixels to use when adding an image to the Media Library. 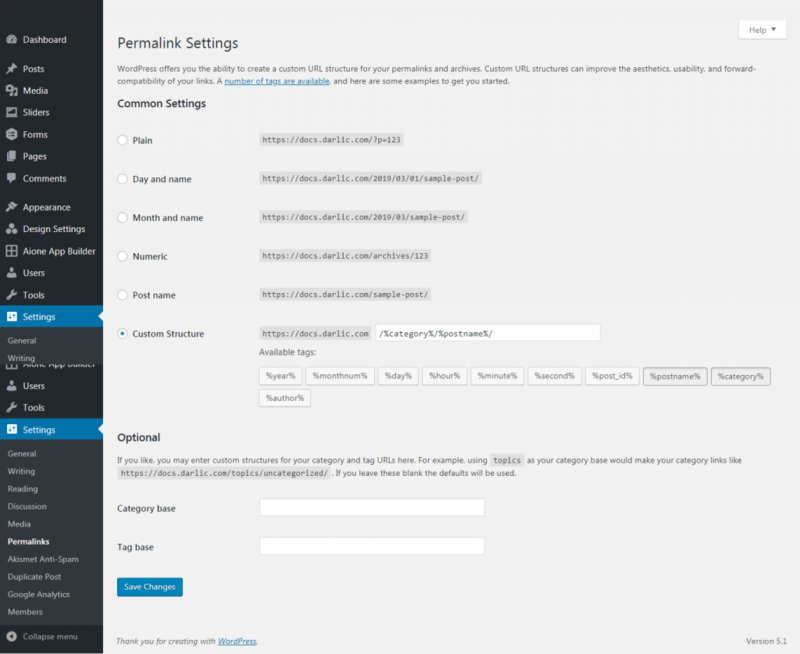 Permalinks are the permanent urls to the individual pages, blog post, category, and tag archives. Check one of the radio buttons corresponding to the correct Permalink Structure for your blog. Custom structure:In the box specify the custom structure you desire to use. One example is /archives/%year%/%monthnum%/%day%/%postname%/. This option allows you to set the custom base for the categories and tags. That is you can create a custom URL for categories and tags. For example, using /topics/ as your category base would make your category links like http://example.org/topics/uncategorized/. Category base - Enter a custom prefix for your category URLs here. Tag base - Enter a custom prefix for your tag URLs here. This screen provides three tabs. First tab lets you replicate the pages or posts elements. Second tab is when there is a need to provide permissions to specific roles and last tab lets you display a link to clone the current post. Post/Page elements to copy: Check the boxes next to the elements that you wish to replicate. (Title, Date, Status, Slug, Excerpt, Content, Featured Image, Template, Format, Author, Password, Attachments, (you probably want this unchecked, unless you have very special requirements) Children, Comments (except pingbacks and trackbacks) Menu order). Title Prefix: Enter the prefix to be added before the title, e.g. "Copy of" (blank for no prefix). Increase menu order by: Add this number to the original menu order (blank or zero to retain the value). Do not copy these fields: Comma-separated list of meta fields that must not be copied. Do not copy these taxonomies: Select the taxonomies you don't want to be copied. Roles allowed to copy:In order to provide access, check the boxes next to the roles (Administrator, Editor, Author, and Contributor). Warning: Users will be able to copy all posts, even those of other users. Passwords and contents of password-protected posts may become visible to undesired users and visitors. Enable for these posts:Check the boxes to select the post types (Posts, Pages, Blocks, Field Groups, and Sliders) for which you want to provide access to the chosen roles. Show links in: Post list Edit screen Admin bar (now works on Edit screen too — check this option to use with Gutenberg enabled) Bulk Actions. Whether the links are displayed for custom post types registered by themes or plugins depends on their use of standard WordPress UI elements. You can also use the template tag duplicate_post_clone_post_link( $link, $before, $after, $id ). Show update notice: Check this box in order to get the notifications of the updates that have been made. To get going, just sign up for Google Analytics, set up a new account and log in with the button below to automatically configure basic settings. You may have to manually adjust settings if necessary. Please keep in mind that it can take several hours before you see any stats. Get access to google analytics account to automatically get the tracking code for this website and enable access to network statistics inside the WordPress Admin Dashboard. Click the button to "Login with google account and get access code"
Site Tracking Code: Your Google Analytics tracking code. Ex: UA-XXXXX-X. The Site tracking code will track this site. Custom Google Analytics Statistics inside WordPress Dashboard: You need to login to google with the button above to use your profile for displaying statistics. IP Anonymization: Click enable or disable radio button. When enabled, the IP address of the visitor will be anonymized. Support Display Advertising: Click Enable or disable radio button. This feature allows you to add demographics and interests reporting to Google Analytics.